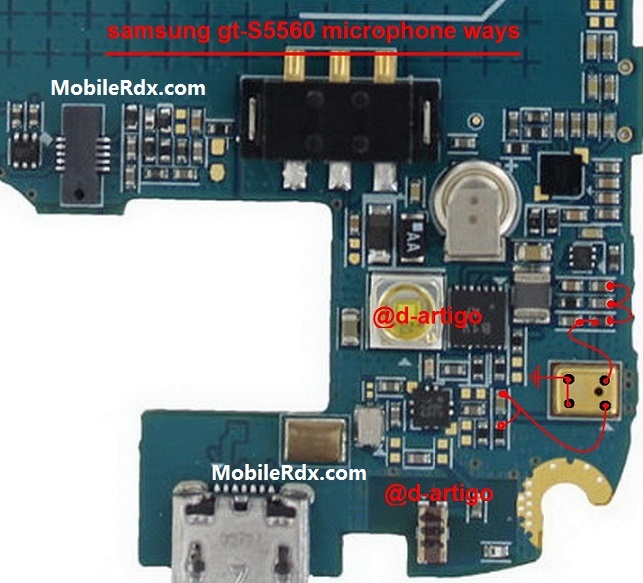 Problems on Samsung Galaxy Gio S5660 Mic Not Working, usually occurs due to mechanical shock and water damage, the damage is very rare if the mic is not caused by two things, water damage or due to the collision, To repair Samsung GT-S5660 Mic Not Working Try The following tips. To do repair Samsung S5660 Mic Not Working, try your first check before hand mic in good condition or not, if the mic is damaged, you must replace the mic with a good mic, if after replacing the mic does not work, check the mic lines as shown below, if there is a path-breaking, try to make jumpers. The first step try to check the mic hole on the mobile phone, which covered the mic hole can result in imperfect voice caught by the mic, so what’s wrong first checking the mic hole. If it is ascertained mic hole no problem, try the next step. 1) Visually check all the highlighted components holds for the microphone, clean using a liquid cleaner kit if an oxidation build up found. 2) Check MIC+ and MIC- connection line track or path for possible open. 3) Check replace the coils, capacitors, and resistors connected in the MIC circuit. 4) Replace the microphone module. If there is a way out of this is lost you can apply a jumper as shown in the diagram fix. In the diagram mic fixes, several small circles indicate that you can apply a jumper on these points if any parts are missing or damaged. And in broken link, You can also apply a jumper at the same place as provided there. Well maybe we explain an article about Samsung Galaxy Gio S5660 Mic Jumper up here, so if you do want to know the latest news.